A High Quality 15m 3.5mm Jack Plug to 2x phono cable. Metal bodied phono plugs with gold plated contacts. Profigold by Bandridge PROV7107 high quality 7.5m scart lead. Enjoy crisp colourful pictures and high fidelity sound with this top notch interconnect and at an everyday price 24k Hard Gold plated contacts, for excellent protection against corrosion. Pearlized chrome plated metal connector with metal inner case, for maximum reduction of RF/EMI interference. Superior flexible outer cable jacket, avoids cable twisting and cable fracture. Color coded plugs with silver soldering, for easy installation and minimum transition resistance. Silver Plated 99,9996% Oxygen Free Copper conductors, for high speed full HD signal transmission. Superior large gauge conductors, for full performance up to 20 meters. Multiple shielding, for maximum protection from RF/EMI interference. High Quality PPE insulation, to ensure crystal clear sound and vision. Interference Absorption technology, to absorb electro Magnetic and Radio Frequency interference. Integrated cable stopper, for optimal cable management. 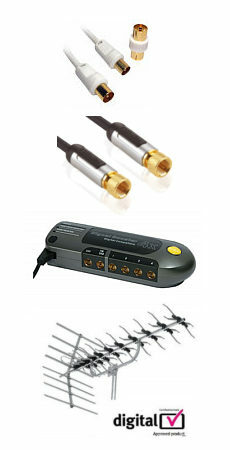 Perfect for audio and video connections between TV & DVD, VCR, Satellite receiver, Digibox etc. S-Video cable 1m, Techlink 680061 S-Video cable for connecting s-video video sources to displays etc. Double shielded non-migratory Oxygen Free Copper conductors throughout. Strain relief adds extra durability when cable is put under extreme conditions and also prevents oxidation. Flexible PVC outer jacket to bend and fit into the tightest of spaces. High quality s video reproduction. Aluminium-mylar foil wrap provides enhanced noise rejection. Machined, gold plated s video plugs for optimised connectivity and signal transfer. Advanced multiple screening against radio frequency interference (RF). What Plasma and LCD TV Annual Awards, 2006-2007: Best Cable Brand of the Year 2007. 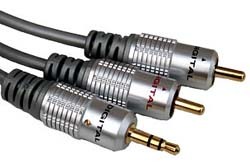 20m digital audio coaxial cable, gold plated contacts, metal connectors. 24k Gold plated, all metal phono plugs. Double shielded coax cable. Ideal for digital audio SPDIF or composite video.